Historic Germantown earns the 2018 Stormwater Pioneers award for their new rain garden, redesigned courtyard space, and commitment to the community and health of our waterways. 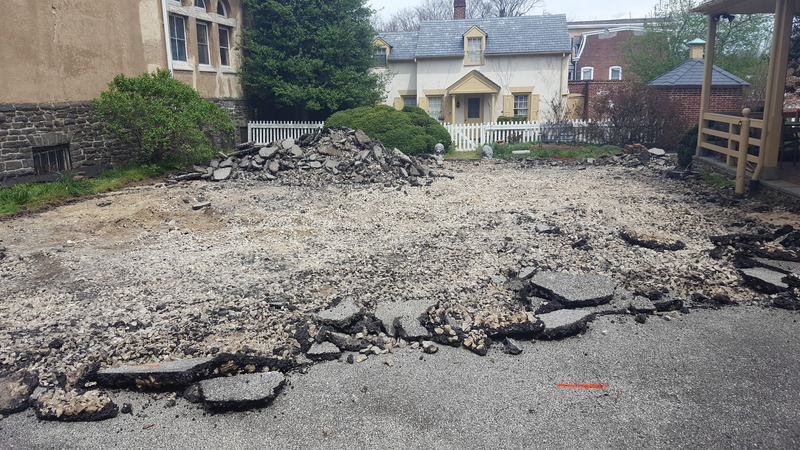 When leadership at Historic Germantown first began making plans to replace their asphalt courtyard with a natural green space, the opportunity to turn it into a showcase for stormwater management wasn't exactly at the top of the organization's list of priorities. In fact, the idea of a green stormwater project wasn't on their list of ideas at all. Despite being in the dark at the beginning, the nonprofit is getting a major spotlight in Philadelphia’s sustainable development community as this year's Stormwater Pioneer. 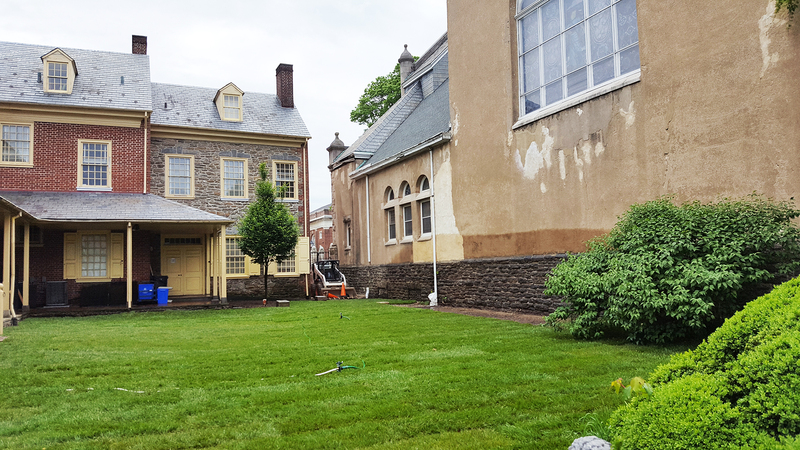 That distinction will be made official during a May 24 ceremony at their Germantown Avenue headquarters featuring City officials, community members, and project partners. Invite Friends on Facebook. Trapeta Mayson, who served as Executive Director of Historic Germantown throughout the planning and construction process, notes that there already had been a fundraising effort underway, including the creation of a GoFundMe page, to help the organization raise resources needed to transform the property. 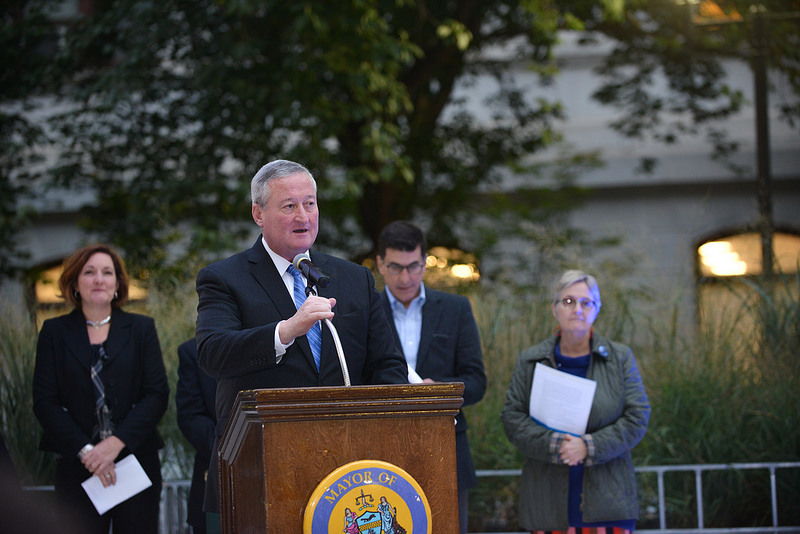 SMIP was launched in 2012 to help the City of Philadelphia achieve federally mandated cuts to pollution from stormwater runoff and related overflows in combined sewers. An older portion of the wastewater collection system, combined sewers carry sewage and water from storms. About $90 million in SMIP grant funding has encouraged green stormwater improvements at 160 nonresidential properties in the city, including schools, nonprofits and faith-based organizations. At first, it didn’t appear Historic Germantown would be eligible for the SMIP program. But after several discussions with Erin Williams, program manager for Stormwater Billing & Incentives at the Water Department, the path began to clear. “She told us they take applications on a quarterly basis, and end up doing about 16 sites a year of all different sizes,” Mayson says. Historic Germantown was one of the smallest. Other details also needed to be worked out. From submitting proposals to working out details and issues and finally getting approval, the process ended up taking about eight months. According to Mayson, the fact that this turned out to be a truly a community-based and community-supported project is one of its most important and rewarding aspects. According to Claudia Levy, a landscape architect who did the design for the project through Levy DiCarlo Partners, Germantown has a longstanding horticulture and landscape history that the new project resonates with nicely. Some of the early pioneers in the horticulture trade created magnificent nurseries and gardens in the Germantown and Mount Airy neighborhoods that continued into the early 20th century, she says. 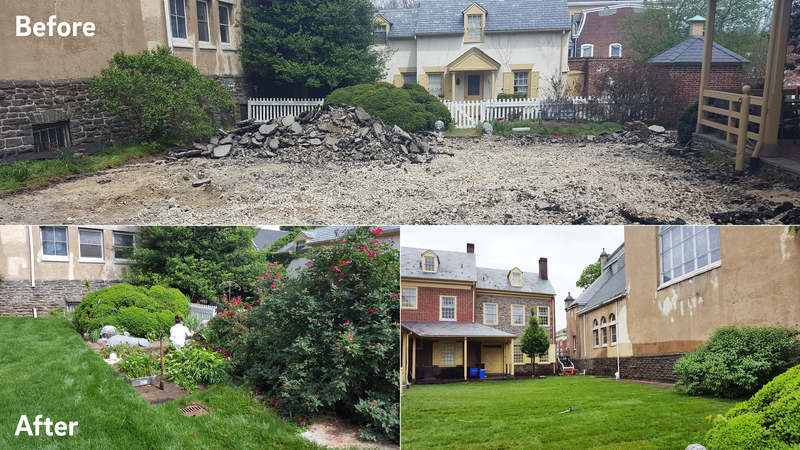 Volunteers and supporters have been very active in maintaining the landscapes of several Historic Germantown sites and contributed several work days to help reduce costs during the courtyard makeover. 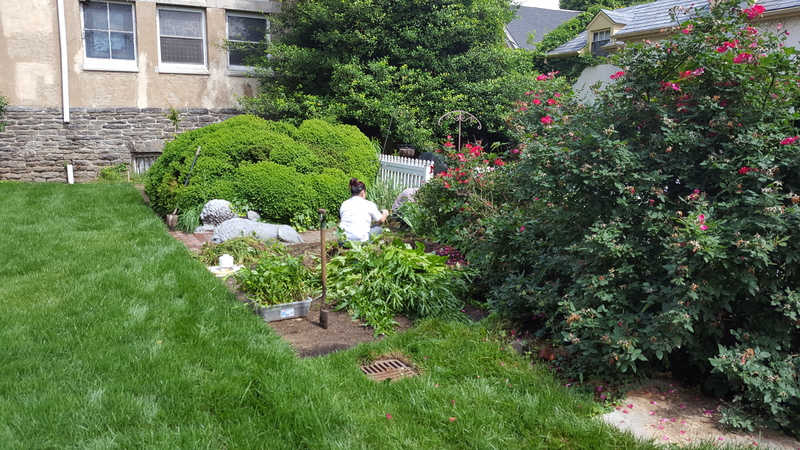 Community members also contributed to the GoFundMe campaign to pay for trees, shrubs, and other plants now thriving in the courtyard and rain garden. Because of the nature of the project, Mayson notes, it was important to get the rain garden in first. The parking lot, in particular, was very much a community-involved work effort. “We had approximately 15 members from our organization helping to clear the area between the parking lot and the street. It took about three clearing days and then three planting days to complete. It literally changed the streetscape,” she says. She adds that the result is earning a flood of positive comments from neighbors and visitors. Apparently, the positive reception planted the seeds for more community support in Germantown. That’s a sentiment that the folks at Historic Germantown are hoping to keep tapping into. In the end, though, it’s more than just a Historic Germantown project, she says. Introduced in 2014, the Stormwater Pioneers award puts a spotlight on stormwater management projects spearheaded by private property owners. These projects showcase innovation, excellence, the ability to overcome technical challenges and a true dedication by the property owners, developers, engineers and designers to improve the environment and reduce stormwater runoff. Previous Pioneers include Popi’s, a small South Philadelphia Italian restaurant where the family ownership used a SMIP grant to build lush rain gardens in the parking lot, and the Children’s Hospital of Philadelphia. Highlighted in 2017, the CHOP project involved a high-tech system of computer-controlled stormwater retention tanks and a therapeutic green roof garden where healing families unwind. The inaugural award went to Stanley’s Hardware in Roxborough. As SMIP participants, Historic Germantown, Popi’s and Stanley’s are eligible to save significantly on monthly stormwater fees charged to nonresidential properties in Philadelphia. Learn more about Stormwater Pioneers and stormwater grant opportunities.